The combination of horizontal lines at the level of support or resistance and price action may be one of the simple but effective forex trading strategies. (Note: Price action is a way of trading by observing and analyzing the forms of pin bar formations that occur at candlestick charts). After determining the horizontal line for the dominant support and resistance, we wait for the formation of the pin bar around that level. Maybe we feel uncomfortable with the number of indicators on the trading chart, and I want to be able to trade with as few indicators as possible but quite valid. Well if that's what we want, maybe it can be tried this way, horizontal lines and price action. Professional traders always look at important levels on the horizontal line. They already know that these levels are very significant and have an impact on the direction of price movements. 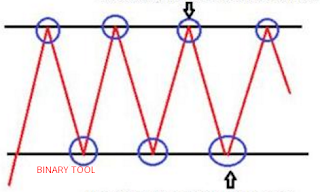 Horizontal lines can be used as a reference to set a stop loss level, and will be effective if combined with a price action by looking at the formed pin bar. For sideways (range bound) market conditions, we only need to look at the formation of pin bars formed at the support and resistance levels (blue circles in the image below). We determine the timing to start the entry if the pin bar signal really shows which ensures that market conditions are still sideway, and still in the trading range. Stop loss and profit target can be determined at a level close to the support or resistance in accordance with the direction of the position of the entry we took. Event area is an area around a horizontal line that shows strong signals for entry based on price action. From the formation of the pin bar formed, break or retest can occur at a certain price level which indicates that the level is significant. The entry should be confirmed by the pin bar that is formed. In the following example, the break bar shows a strong signal to sell, after a retest that confirms that the horizontal line is true is a significant resistance (blue circle in the image). We can sell at the level slightly below the retest point. In the following example, EUR / USD is initially sideway at 1.4100-1.4000 (event area), then breaks down when a pin bar and inside bar are formed. After the retest, prices moved back down. Pay attention to the pin bar and inside bar that are formed and show the levels where we can enter. So by combining support / resistance levels and pin bars that are formed in the surrounding area, we can find out the signals when the right time to enter the market.